Prosecutors rested their case against Boston Marathon bomber Dzhokhar Tsarnaev on Monday after jurors in his federal death penalty trial saw gruesome autopsy photos and heard a medical examiner describe the devastating injuries suffered by the three people who died in the 2013 terror attack. Tsarnaev's lawyer told the jury during opening statements that Tsarnaev participated in the twin bombings but that his older brother, Tamerlan, was the driving force behind the attack. Prosecutors believe the brothers were seeking retaliation against the U.S. for wars in Muslim countries. Now that prosecutors have finished their case, Tsarnaev's lawyers will get a chance to present theirs. The defense has made it clear since testimony began March 4 that its strategy during the two-phase trial is not to win an acquittal for Tsarnaev but to save him from the death penalty. Defense lawyers for Tsarnaev on Monday filed a motion for dismissal of all charges against him. They say the government has failed to meets its burden of evidence in establishing Tsarnaev committed the crimes he is charged with. Three people were killed and more than 260 were injured when two pressure-cooker bombs exploded near the finish line April 15, 2013. 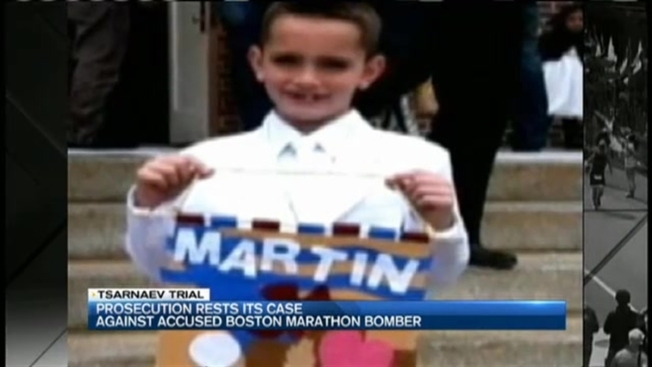 Prosecutors presented heart-wrenching testimony from survivors who lost legs in the bombings and from the father of 8-year-old Martin Richard, the youngest person killed in the explosions. A string of first responders described a chaotic mix of smoke, blood and screams just after the bombs went off. Jurors openly cried as they viewed Martin's autopsy photos, which showed a gaping wound in his abdomen. Dr. Henry Nields, chief medical examiner for Massachusetts, said Martin received injuries to virtually every part of his body, including lacerations of his liver, left kidney and spleen. His stomach was also ruptured. Jurors in the trial of Boston Marathon bombing suspect Dzhokhar Tsarnaev have been shown pressure cooker parts, BBs, nails and a piece of hobby fuse that were found in his apartment. Nields also displayed the blood-stained, shredded clothing that Martin was wearing when the blasts went off. His parents listened from the second row of the courtroom, and Bill Richard kept his arm around his wife's shoulder. Nields said Martin suffered broken bones and third-degree burns. The injuries caused him to bleed to death. Tsarnaev's lawyers did not cross-examine any of the victims but instead focused on trying to show that Tamerlan Tsarnaev was more culpable in the attack and in the killing three days later of Massachusetts Institute of Technology police Officer Sean Collier. 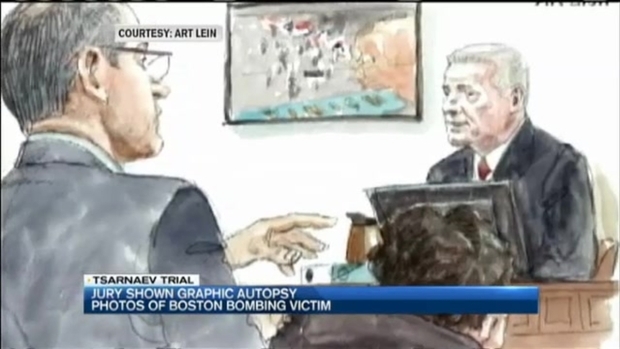 Jurors in the trial of Boston Marathon bomber Dzhokhar Tsarnaev have been shown graphic autopsy photos of one of the three people killed in the attacks. The defense case is expected to be relatively short. Once that is complete, jurors will deliberate on whether Tsarnaev is guilty of the 30 federal charges against him in the bombing, in Collier's killing and for his role in a violent confrontation with police in Watertown. Tamerlan Tsarnaev, 26, was killed during the confrontation, both by gunshots and from being run over by Dzhokhar as he escaped. Dzhokhar Tsarnaev was found more than 18 hours later hiding in a boat parked in a Watertown yard. If the jury convicts Tsarnaev - an event that may be a foregone conclusion because of his admitted guilt - the trial will move on to the second phase, when the same jury will hear more evidence to decide whether Tsarnaev should be put to death or should spend the rest of his life in prison. During this second phase of the trial, Tsarnaev's lawyers will present evidence of factors they believe mitigate his crimes, such as his age at the time - 19- and the influence of his older brother. The Tsarnaevs - ethnic Chechens - lived in the former Soviet republic of Kyrgyzstan and the volatile Dagestan region of Russia before moving to the U.S. with their parents and two sisters about a decade before the bombings. They lived in Cambridge. Prosecutors will present evidence of aggravating factors, such as the brutality of the attack and the death of an 8-year-old boy in the bombings, to argue that Tsarnaev should be executed.